Telltale Games, creators of hit episodic story games like The Walking Dead, The Wolf Among Us, and Batman: The Enemy Within, is going under. Around 250 employees lost their jobs in one fell swoop as the studio shut down. How did this award-winning studio end up in this sorry state? According to the former Telltale employees, it could be because the studio that so successfully put an emotional and human element in the forefront of its games fatally neglected these aspects in its own offices. Remember those old choose-your-own adventure books where you'd turn to numbered paragraphs depending on your choices, resulting in a different story depending on how you played? Sometimes, choices and items you made would carry over to another book in the same series. Telltale Games essentially revised this formula for a digital medium, with a dash of old-school point-and-click adventure (the company was founded by former LucasArts employees) and the important final ingredient: adapting a popular film or TV license for a quality product, not a lazy cash grab. This was the magic formula that cooked up Telltale Games: The Walking Dead. It wasn't even the first licensed game by the studio, but the perfect combination of stellar voice acting, tight narrative design with high emotional stakes at key decision points, well-crafted atmosphere and writing that felt authentic to the world built by the comics and TV show made the game a smash hit and the studio a star. Although Telltale Games offerings are often described as games of choices, in reality, the consequences of those choices and interactivity, in general, was quite limited. The games were essentially linear, with minor deviations from the main path here and there, but with the major story beats and developments along a straight line. But excellent writing and delivery effectively sold the illusion of choice, and made these small decisions feel weighty and full of drama to the players. Playing The Walking Dead is to be lured into caring about Clementine and all the details, small and big, that affect her journey of survival and shape the person she becomes. Telltale wasn't going to let go of a winning formula. The studio snapped up licenses and resolved to churn out episodes like crazy. Everything from Minecraft to Batman to Game of Thrones. Of course, more licenses meant more stakeholders expecting a return on their investment, which translated to more pressure on a relatively small team to deliver the same quality that had made TWD a hit, but more stuff, and faster. The wolf had bitten off more than it could chew. This isn't the first time Telltale Games has had mass layoffs. Last November the company laid off 90 employees, which was approximately 25 percent of its workforce. Nonetheless, it seemed that the company could struggle on and honor its commitments. With regard to the current closure, Telltale co-founder Dan Connors told Variety that the sudden decision to shut down was connected directly to a failed round of financing. "Unfortunately, when the last potential financial backer abruptly pulled out, we were left in a position where we had no choice but to stop production. Sadly, everyone was so focused on doing what was required to keep the company going that when the last potential partner backed out, there were no other options." Currently, a skeleton crew of just 25 remain at Telltale to finish the studio's obligations to its board and investors. While the current closure proves that the company just couldn't quite hold it together, it doesn't take a genius to see why Telltale Games' formula lost its luster. 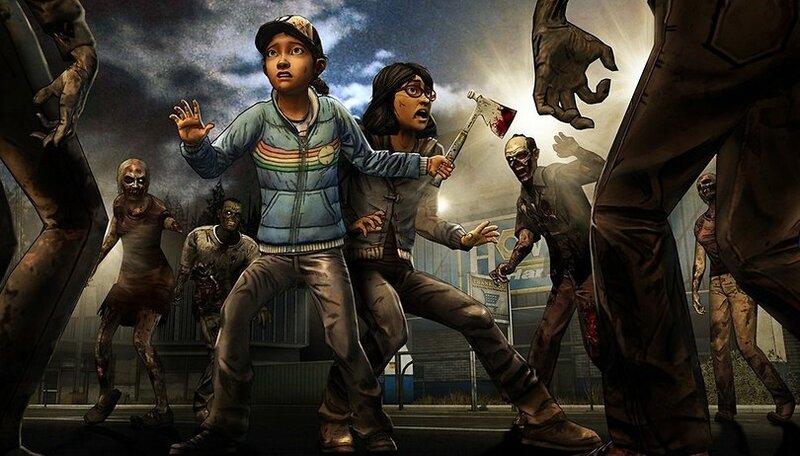 The heady rush of The Walking Dead's success led Telltale Games to overextend itself when it came to licensed properties and games. As we often see in the tech industry (and to be fair, not just tech), when something works, the knee-jerk reaction from companies is to make as many copies of it as quickly and cheaply as possible. In the case of Telltale Games, it seemed like a studio was hell-bent on poisoning itself by saturating its own market. This may not have been a problem if the Telltale had taken more care to differentiate its games from each other, or even introduce new mechanics or ideas. As it is, all Telltale releases stuck to a strict formula of a linear story with dramatic but illusory choices. It didn't matter whether you were playing The Walking Dead, Batman or Game of Thrones. The kind of quality writing that marked standout Telltale games like the first two Walking Dead seasons, Tales from the Borderlands and Wolf Among Us doesn't come fast or easy. I don't doubt the stellar talent at that company, their best work speaks for itself. But Telltale couldn't sustain its quality across the board since it was spread so thin. And the over-reliance on trying to capture lightning on a bottle over and over again became a tired meme in itself. Just dropping the name 'Telltale Games' in gaming circles was a byword for predictability. When budgets at a company get tight, the onus usually falls upon the rank-and-file employees to make more product, faster. In the games industry stands out as an egregious example of this, with tales of overworked employees working round the clock, 6 days a week during 'crunch' periods before deadlines are notorious. Even before the closure, reports surfaced of a toxic culture of mismanagement and overwork at Telltale Games. - Your hot takes about the company making weird/not great decisions are not new, surprising, or revelatory to any of us. According to a report by The Verge earlier this year, "Focus on quality really started to shift to ‘let’s just get as many episodes out as we can'". Telltale games employees reported pulling 18 hour days, 80+ hours a week for weeks on end, going month to month in a constant state of crisis. The 'crunch' period never ended, and just became normality. The company pursued growth, growth, growth without sustainability, and found itself having to honor the demands of too many important IP holders at once. The trouble is, is that people can only produce so much at a consistent quality, no matter how hard you drive them, no matter how late they stay up and weekends they work. "The pace at which the studio operated was both an amazing feat and its biggest problem," says a former employee. "Executives would often ask teams to rewrite, redesign, recast, and reanimate up until the very last minute without properly adjusting the schedule. The demands on production only became more intense with each successive release, and at some point, you just don’t have anything left to give." Telltale tried to reform in 2018, bringing in new leadership to try and turn around the studio's fortunes, but the damage had already been done and the company was still over-extending itself to meet the demands of too many projects. The real tragedy here though isn't the loss of uncompleted games or the demise of Telltale, but the treatment of the individuals who worked there. Telltale laid off over 200 staff without giving them advance notice or severance pay. According to one, some started at Telltale just a week before the layoffs and some of those people have children. At least one relocated across the country for a promise of a new life that turned out to be doomed, a terrible decision by a company that couldn't afford to make it and devastating for the hardworking employees who broke their backs for an employer who didn't have theirs. The possibility that the company could make revenues off finishing The Walking Dead's season after suddenly kicking staff to the curb without severance is insult to injury, to say the least. Telltale Games is currently a cause celebre and the outpouring of support from the ex-staff member's colleagues in the video games industry is heartwarming to see, but it's important to remember that Telltale Games' bad choices aren't the story of one company, but are endemic in not just the games industry, not just the tech industry but widespread across the world of work. It's ironic that a company whose brand was storytelling, choice and consequence, didn't have the narrative savvy and foresight to see that it was being the bad guy, or where this story of hubris, overreach and abuse was leading. There's no happy ending to this, only some hopes of new beginnings for the talented staff that found themselves betrayed. Companies such as Blizzard, Bioware, Ubisoft SF have already extended hands to ex-Telltale devs and designers. Telltale's legacy of well crafted narrative games will live on, not just through the migrating talent of Telltale veterans, but also games like Firewatch and Life is Strange that built of their winning format. But the wider culture still needs to wake up. Pro-union group Game Workers Unite has called for greater organization against exploitation in the workplace, and this would be a crucial step in securing both a more sustainable future the industry and better games for consumers. It's also a caution to CEOs who are tempted to run a successful formula into the ground without considering the human cost. A company that doesn't respect its workers won't respect its consumers either, and they will notice. The tale of Telltale is one with a moral, so let's, in the company's own words, "remember that". Do you have fond memories of any Telltale games? How do you think the industry can reform to prevent another situation like this? Oh laugh at me. That was travelers tales. Got my tales software mixed up.